Looking eastward across the Monte Carlo waterfront in Monaco on the Cote d'Azur in Provence, France in Europe. The waterfront of Monte Carlo in Monaco, Provence in France has more luxury yachts visit than probably any other harbour in Europe. Monaco is almost the smallest principality in the world at 151 hectares, the Vatican being the smallest at 44 hectares, but it is definitely the most populated. Monaco is on the route of Corniches de la Riviera, specifically Corniche Inferieure which hugs the coastline for 33 kilometers. Monte Carlo in Monaco on the Cote d'Azur in Provence, France is one of the four quarters of the principality. It is not the capital as it is sometimes thought, and because of the Casino is also the wealthiest. If visitors tire of the Casino they could visit the beautiful Monaco Cathedral, The Prince's Palace and the Napoleon Museum or stroll along the waterfront and sunbathe on the sandy beaches. 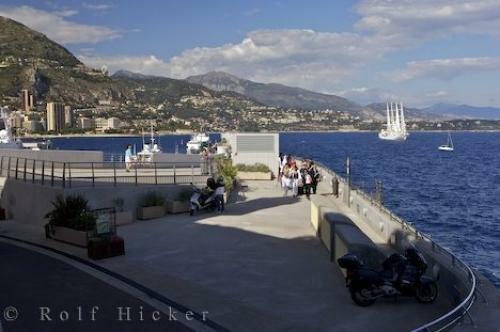 Photo of Monte Carlo waterfront in Monaco, on the Cote d Azur in Provence, France in Europe. I photographed this photo with the digital SLR camera model Canon EOS-1Ds Mark II, aperture of f/7.1, exposure time of 1/200 sec. on ISO 100, as always I used a original Canon Lens, the focus lenght for this picture was 43mm.